Returning home from town recently, I turned off the highway onto a back road. A car from the opposite direction turned in front of me. It was an old-fashioned car. A tag on the license plate read "1931 Model A Ford." Seated inside the cab were an older man and woman out for a Sunday drive. The front seat must have been narrow because the couple sat close together, their shoulders almost touching. From my vantage point, a few yards back, their silhouettes seemed to be framed in a picture. 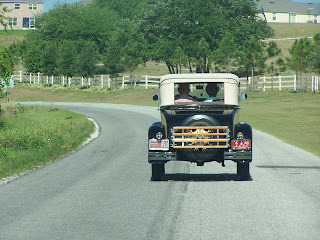 It felt as if I were driving behind a rolling portrait of a bygone era. I followed in their wake for about five miles. Our two cars -- mine new but dusty, theirs old but shiny -- chugged along at an easy pace. Up hills and down, around curvy bends, the road threaded its way through the countryside. The two of us traveled along independently, but I sensed a shared purpose. We wanted a road that offered beauty as well as quiet, contour as well as color. I doubt if either of us was disappointed despite the changes so obviously afoot. During the past 15 years, I've watched the landscape bordering this particular route undergo a slow but steady transformation. For years, like so much other local acreage, it was mainly grove land interspersed with the occasional homestead. Eventually, groves gave way to pastures and, through the past few years, pastures to subdivisions. A few old homesteads remain but most are a sorry lot, run-down and neglected. A small herd of cattle continues to glean sustenance from the hardy grasses, but their pastureland is reduced, hemmed in by a series of brick-walled communities. Despite the juxtaposition of cattle and subdivisions, the road has maintained its integrity. When the developers came, they didn't expand the two lanes to four or redirect its circuitous route. By refraining from such indignities, they kept intact a bit of history. Traveling over the rolling hills behind the antique car, I could almost imagine what it must have been like to drive this same road during the 1930s. Back then, Model A Fords were all the rage, and the opportunity to take even a short car ride was cause for celebration. We hardly ever celebrate driving now. Cars are instruments of necessity to move us from Point A to Point B as quickly, comfortably and, hopefully, inexpensively as possible. My own car is a minivan that thinks it's a truck. The fold-into-the-floor seats enable me to switch back and forth easily from hauler of people to hauler of goods too big to fit in a traditional trunk. I like my car. It's a practical and efficient mode of transportation for a contemporary person whose multi-tasking lifestyle demands constant conversion. But it's no Model A Ford. It's not a classic. Perhaps someday, I'll have the time, inclination and ability to own a vintage vehicle. Then, instead of riding admiringly behind someone else driving a classic, I'll be at the helm, steering my own antique auto around potholes, over hillocks and across countryside as fraught with contradictions as a vintage car is in the modern world. It's a fine fantasy, one of those "maybe somedays" that dwell in passages of the mind. But I'm no car person, and I imagine that owners of classic cars need at least a little mechanical know-how. An appreciation of beauty, however, is a quality I have in spades. Last weekend, on that quiet country lane, I drove behind beauty, and I'm better for the experience. Sometimes taking it slow is the best way to appreciate a world that's so quickly disappearing.